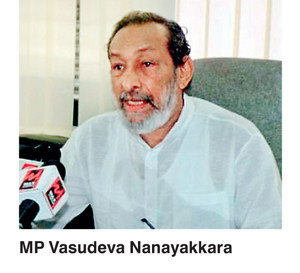 The Joint Opposition yesterday urged the Government to appoint a special select committee to investigate the controversy-ridden coal tender for the Lakvijaya power plant. Speaking to the media, MP Vasudeva Nanayakkara charged that the alleged involvement of the previous Power and Energy Minister Patali Champika Ranawaka in calling for tenders from coal suppliers had led to the adoption of a higher bid. “As we learnt, there were few other bidders who could supply coal for a lower price than the selected bidder. This is a plan by the Government to misuse public funds,” he alleged. However, Nanayakkara added that due to the change of ministerial portfolios, the blame had been shifted to the present Power and Renewable Energy Minister Ranjith Siyambalapitiya. Nevertheless, Minister Siyambalapitiya told the media last week that he would make a full statement to Parliament about the allegations over the tender bidding process for coal suppliers to the Lakvijaya power plant since he had nothing to hide. Meanwhile, the Supreme Court issued an order suggesting that the Government call for fresh tenders to supply coal for the Lakvijaya power plant and dismissed the petition filed by Singapore-based Noble Resources International Ltd. as it was a foreign company and therefore could not be shielded under Sri Lankan law. Furthermore, MP Bandula Gunawardena said that the Joint Opposition expected to file a petition against the Value Added Tax (VAT) Bill, which is scheduled for a Second Reading on 20 July. “Our intention is to prevent the VAT hike legislation. Also, we urge the Government to implement the fiscal proposals that had been pledged by the Budget 2016 instead of tabling new policies,” he stated. Addressing the media, former minster Professor G.L Peiris claimed that Prime Minster Ranil Wickremesinghe was attempting to sign the Economic and Technology Cooperation Agreement (ECTA) without discussing it with President Maithripala Sirisena. Prof. Peiris alleged that if any adverse effects resulted from the ECTA, the Government would not be able to seek the involvement of local courts in solving the matter because it was an international agreement. “Therefore the Government should call for a referendum in order to seek public approval for the ECTA,” he said. The Government has appointed a three-member committee to monitor the tender procedure of the Norochcholai Coal Power Plant, the Ministry of Power and Renewable Energy said yesterday. Issuing a statement, the ministry added that the appointments were made under the directions of the Power and Renewable Energy Minister Ranjith Siyambalapitiya. Accordingly, Prof. K.K.Y.W. Perera, Prof. Lakshman R. Watawala and Prof. Janaka B. Ekanayake have been appointed to the committee.